House Republicans this week will release their budget plan for the next fiscal year, an annual exercise that has opened GOP lawmakers to attacks from Democrats who accuse the GOP of chipping away at the nation's safety net for the poor and middle class. Now, House Republicans are looking for new ways to play offense before Democrats define the debate. Written by House Budget Committee Chairman Paul Ryan, the budget's newest iteration will seek to balance the federal budget in 10 years in part by assuming the repeal of the 2010 federal health care law and by implementing substantial changes to Medicare. Even though it is unforeseeable that President Barack Obama's signature policy achievement will be repealed, Medicare changes are expected to give Republicans the most trouble. Ever since Ryan first proposed a Medicare overhaul when he took the reins of the panel in 2011, Democrats have hammered Republicans who have gone on the record in support of it. And they're going to do it again this year. Democrats are already busy sharpening their knives in preparation for the release of Ryan's new budget. The Democratic Senatorial Congressional Committee, to name just one group, is preparing a full-out digital media assault against Republican Senate candidates who support the GOP plan. 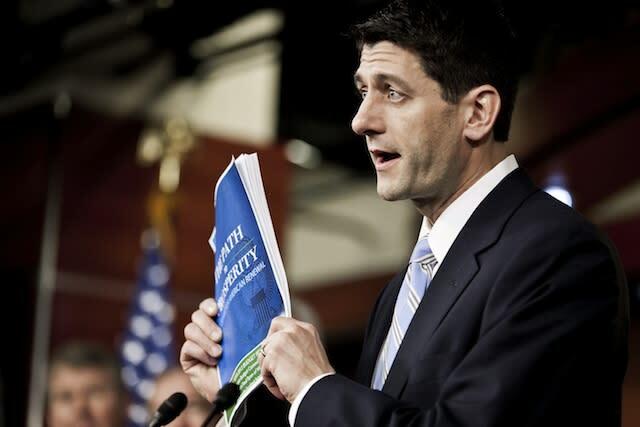 "The Ryan budget will be a gift that gives throughout the 2014 cycle for Democrats," said Geoff Garin, a Democratic pollster. Republicans, however, feel this time could be different. Their ability to strike back is made easier by the fact that Senate Democrats will attempt, for the first time since 2009, to pass their own budget resolution. That proposal, according to early reports, will seek to shrink the deficit by combining a series of tax increases with moderate spending cuts, which Democrats religiously refer to as "a balanced approach." Unlike the Republican budget, the Democratic outline does not balance the federal budget in the foreseeable future. And that is precisely the vulnerability that Republicans plan to strike. Democrats have owned the phrase "balanced approach" in recent national debates. Obama uses the term constantly to hammer Republicans who want to narrow the budget gap through spending reductions alone without raising taxes. (Republicans counter that Democrats have already passed measures that garner new tax revenue when they passed legislation to avoid the so-called fiscal cliff earlier this year. They also point to the new taxes within the health care law, which will be fully implemented in 2014.) In the next several weeks, expect Republicans to start using Obama's "balanced approach" line to take Democrats to task for not offering a plan to balance the budget. "It will be a tough fight," Scarpinato said, "but we think we'll win it at the end of the day."